If you are looking for portable wheelchair scooter vehicle access ramps and accessories, you have come to the right place! 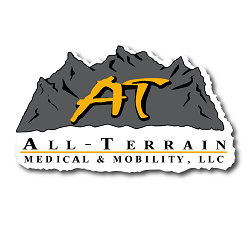 At All Terrain Medical, we specialize in carrying a wide variety of wheelchair accessories and personal mobility products, such as ATV all terrain mobility scooter power chair vehicle carriers. No matter what type of wheelchair accessories you are looking for, whether you are looking for ATV all terrain mobility scooter power chair vehicle carriers or other types of accessories, we sell the widest selection available online today. We can even outfit your mobility choice with more than a dozen different lights! Select the one that is uniquely you for your ATV all terrain mobility scooter! If you are ready to purchase an ATV All Terrain Scooter or other accessories for your all terrain ATV vehicle, visit our All-Terrain Vehicles page today. We are sure you will find just what you are looking for! If you need help finding the ATV all terrain mobility scooter power chair vehicle carriers you specifically need -- or any other portable wheelchair scooter vehicle access ramps and accessories -- feel free to contact us by completing our simple online contact form or by calling us toll free at 1-877-ALL-TER-1. We will be happy to help in any way that we can!